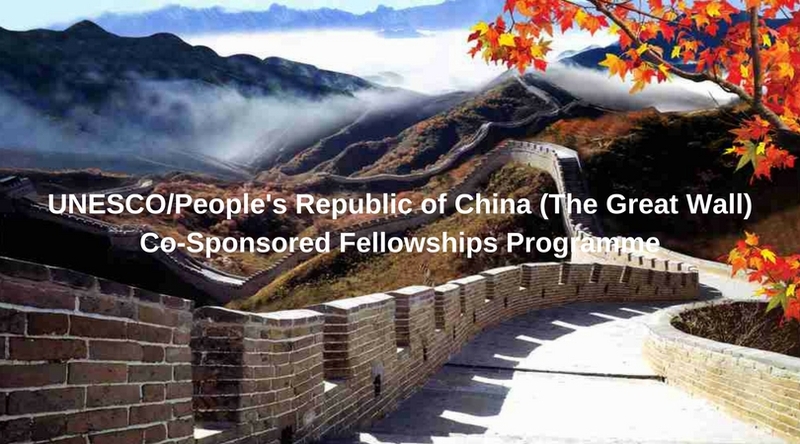 UNESCO/People’s Republic of China Co-Sponsored Fellowships Programme 2018-2019 (Study in China). The Government of the People’s Republic of China through UNESCO is offering seventy-five (75) fellowships for advanced studies at undergraduate and postgraduate levels for the academic year 2018-2019. These fellowships are for the benefit of developing Member States in Africa, Asia–Pacific, Latin America, Europe and North America and Arab region. Tenable at a selected number of Chinese universities, these fellowships are intended for scholars who plan to pursue advanced studies or undertake individual research with periodic guidance from the assigned supervisor in China for a duration of one year. Selected candidates will undertake their studies in the host universities as visiting scholars. Most of the study programmes will be conducted in English. Selected candidates will undertake their studies in the host universities as visiting scholars. In exceptional cases, candidates may be required to study Chinese language before taking up research or studying in their fields of interest. Twenty (20) of the 75 fellowships are especially intended for candidatures from the Teacher Training Institutions supported by UNESCO-CFIT Project in the 10 African countries to pursue an Advanced Training Programme for Education Administrators and Teacher Educators at East China Normal University. Applicants applying for Senior Scholar programmes must be a master’s degree holder or an associate professor (or above) and not older than the age of fifty (50). Pre-admission letter is not mandatory for application. Step 1: Read carefully the Announcement letter, especially the attached ANNEX II, for UNESCO/China Co-Sponsored Fellowships Programme 2018-2019 to understand the requirements for eligible candidatures and the procedures for the submission of application. Step 2: Contact the National Commission for UNESCO of your country to enquire the application procedures at national level. Click here for the information to contact the National Commissions for UNESCO. Step 3: Prepare your application documents (in English or Chinese) properly according to the requirements prescribed in ANNEX II. Step 4: Submit your application to the National Commission for UNESCO of your country. NOTE: As National Commission for UNESCO of the invited countries will select and transmit the applications of nominated candidates to UNESCO Paris Headquarter by 26 March 2018 at the latest, applicants are advised to submit their application to the National Commissions as early as possible. Step 5: As soon as You are informed by the National Commission for UNESCO of your country that you are nominated as a candidate for this programme, you should complete the online application and submit all the supporting documents on the online application system of China Scholarship Council. Note: Hard copies of application documents are not required any more from this year and it is mandatory for each nominated candidate to submit his/her application in the online application system. Candidates should mention their serial number of online application when their applications are submitted to UNESCO. Any application without online registration will not be considered. Step 6: Your online application form, along with the endorsement letter from the National Commission for UNESCO of your country and all your application documents should be submitted to Mr Stoyan Bantchev, Chief of the Participation Programme and Fellowships Section by e-mail (s.bantchev(at)unesco.org), with b.qin(at)unesco.organd v.lopy(at)unesco in copy by 26 March 2018 at the lates. Click here to see the instruction for your online application. For more information, visit UNESCO. ← Wells Mountain Initiative (WMI) Scholars Program 2018 for Students from Developing Countries.